The NMR Facilities in the School of Chemistry are some of the best equipped in the UK, with 12 solution-state NMR spectrometers (300-700MHz) used for research and undergraduate teaching, as well as being available for industrial use (see below for our capabilities). Operates across 300-500MHz, including a 500MHz 13C-cryogenic spectrometer offering the highest sensitivity for 13C NMR in the UK. As well as using cutting-edge 1H- and 13C-based NMR methods, with capabilities including molecular structure elucidation, reaction monitoring, diffusion measurements and quantitative NMR, we can also study a diverse variety of materials through a wide range of other nuclei e.g. 11B, 19F, 31P, and transition metals. Equipped with 600 MHz and 700MHz spectrometers equipped with a salt-tolerant 13C-enhanced triple resonance cryo-probe, a 1H,13C capillary flow probe and liquid handling robot and a 1.7mm microcryoprobe (the most mass-sensitive NMR spectrometer in UK academia). The facility is involved in tackling projects that impact on human health, including structural biology, supramolecular chemistry, medicinal chemistry and compound screening. The science base is both publicly and industrially funded and there is a strong drive to increase further industrial collaboration. A collaboration with the Department of Social and Community Medicine, comprising 500MHz and 600MHz ultra-high throughput NMR systems including a high sensitivity liquid-nitrogen 'Prodigy' probe to maximise data quality and minimise experiment times. This Facility specialises in quantitative, high-throughput metabolic profiling of human serum/EDTA-plasma and metabolite profiling. 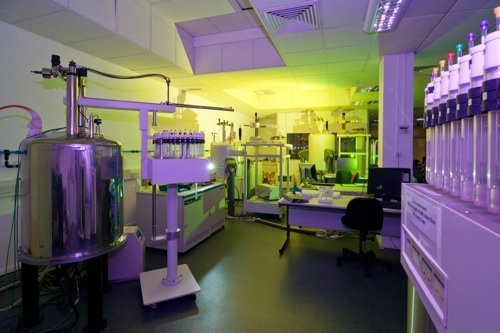 As well as being the first-choice technique for characterisation of new organic compounds, the NMR facilities at Bristol are also used for studying 11B 31P 19F and a wide variety of transition metal nucleii.